This evening at Margaret Kuo's Peking Restaurant in the Granite Run Mall, Alex Charlton, President of the Delaware County Chamber of Commerce announced this year's winner of the 25th annual Athena Award recognizing winner, Dana Riker Jackson, President and CEO of Riker Opportunity Institute, Inc.for her outstanding leadership, community service and business success. Listen to the announcement and comments HERE. The Athena International 25th anniversary announcement party and celebration to announce this year’s winner will be presented by the Delaware County Chamber of Commerce on Tuesday, October 15th at 4 p.m. at Margaret Kuo’s Peking in the Granite Run Mall. Margaret Kuo, 2009 Athena International Award recipient, hosts this lovely event in her venue, Peking, with light Chinese fare and beverages. 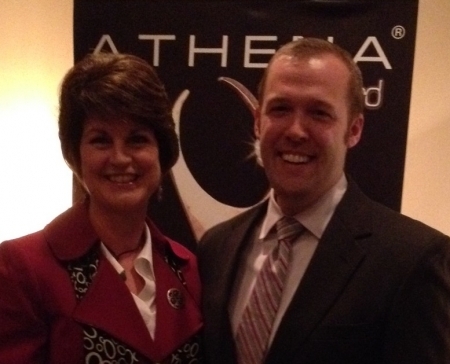 Citadel FCU is the sponsor of the 2013 Athena Award presentation. The ATHENA Leadership Award was inspired by the goddess of Greek mythology known for her strength, courage, wisdom and enlightenment, qualities embodied in the ATHENA Leadership Model. The Award is unique in both scope and the ATHENA mission upon which it is based. The ATHENA Leadership Award is presented to a woman who is honored for professional excellence, community service and for actively assisting women in their attainment of professional excellence and leadership skills. Since the program’s inception in 1982, nearly 6,000 exemplary leaders in over 500 communities have received the prestigious ATHENA Award in the United States, Bermuda, Canada, China, Greece, India, Russia, Unite Arab Emirates and United Kingdom. By honoring exceptional leaders, the ATHENA Leadership Award Program seeks to inspire others to achieve excellence in their professional and personal lives. The ATHENA Leadership Award is presented annually by chambers of commerce, women's organizations and universities. The award is established through local host organizations in partnership with ATHENA International's national underwriters, local businesses and individual sponsors. This is the 25th year of the Delaware County Chamber of Commerce presenting this award, which will be celebrated at the Annual Dinner at the Drexelbrook on November 21st.